LEXINGTON, Ky. (Oct. 18, 2018) — Are Uber and Lyft making traffic in a major U.S. city worse? The short answer is yes — according to the San Francisco County Transportation Authority, who partnered with the College of Engineering at the University of Kentucky on a new report. “TNCs and Congestion” provides the first comprehensive analysis of how Transportation Network Companies (TNCs), such as Uber and Lyft, have collectively affected traffic in San Francisco. The research reveals that congestion throughout the city — measured in miles driven, vehicle speed and traffic delays — has worsened from 2010 to 2016, with half of that slowdown attributed to the rise of ride-hails. Greg Erhardt, an assistant professor, led the research team that conducted the analysis and drafted the findings. He was joined by Mei Chen, an associate professor, and Sneha Roy, a doctoral degree candidate. All three are part of the transportation engineering and data science program in the Department of Civil Engineering. "The rise of TNCs is the dominant transportation issue currently facing San Francisco, and a leading indicator of the transition to autonomous vehicles (AVs). Whereas much of the public debate thus far has been based on speculation, this research provides an objective and data-driven evaluation of the effect of TNCs on congestion. It provides decision makers in San Francisco and other major cities with a basic understanding of this issue, allowing them to craft more effective policies in response," Erhardt explained. The report utilized INRIX data, a commercial dataset which combines several real-time GPS monitoring sources with data from highway performance monitoring systems and a unique dataset provided to the transportation authority by researchers from Northeastern University. These data are augmented with information on network changes, population changes and employment changes provided by local and regional planning agencies, which are used as input to the transportation authority’s activity-based regional travel demand model SF-CHAMP. 55 percent of the average speed decline on roadways during that same time period. The transportation authority estimates that TNC's comprise 25 percent of total vehicle congestion (as measured by vehicle hours of delay) citywide and 36 percent of delay in the downtown core. Notably, the report indicates that ride-hailing activity affects congestion differently throughout the day and throughout the city. For example, they caused increased traffic across all times of day, including the morning peak, midday and evening peak, but the increase was most pronounced in the evening. Consistent with prior findings from the transportation authority’s 2017 TNCs Today report, ride-hailing companies also caused the greatest increases in congestion in the densest parts of the city — up to 73 percent in the downtown financial district — and along many of the city’s busiest corridors. 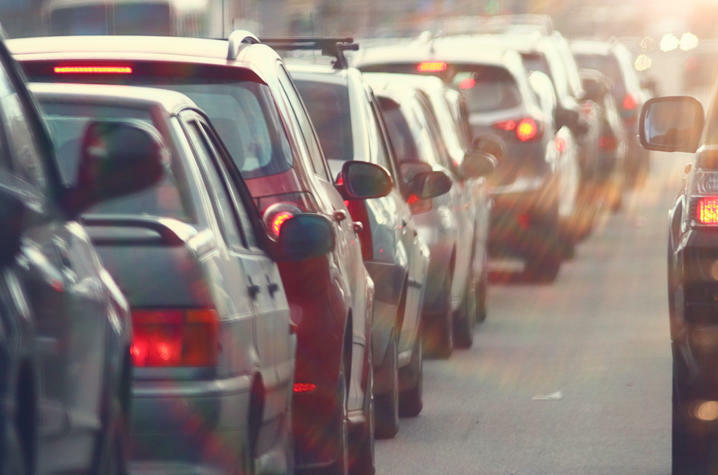 Vehicle hours of delay: Measuring the overall amount of excess time spent in congestion, it is the difference between congested travel times and free flow travel times on a given roadway segment. Vehicle miles traveled: A measure of the overall amount of travel, as measured in distance, that occurs on the streets. Speed: The average speeds on streets. The full report, downloadable data files and an interactive map are available online.